THIRTY-FIVE APPLE PIES in less than two hours. I paced myself this year, taking two bites from each — just enough to feel confident to rate the pies on appearance, presentation, crust, texture, and flavor. My stomach was full at the end and I felt mildly uncomfortable for the next few hours, but it was worth it. I tasted some exceptional apple pie. 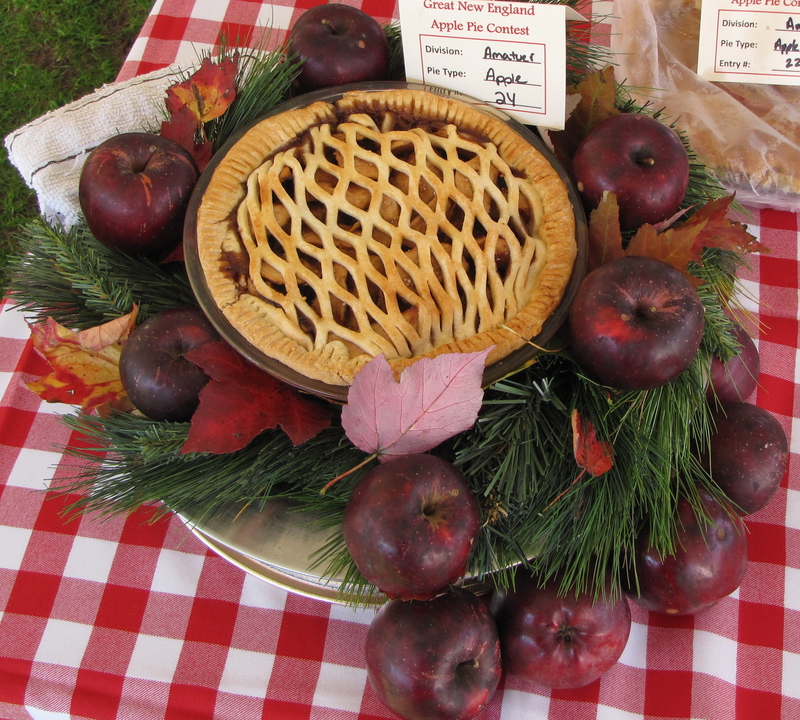 The pies were entered at the second annual Apple Pie Contest at AppleFest, a two-weekend festival featuring food, crafts, music, and other entertainment (and of course lots of apples), at Mount Wachusett in the north-central Massachusetts town of Princeton. The 2011 fair, which continues today from 10 a.m. to 5 p.m., and again next weekend, is the 28th annual. 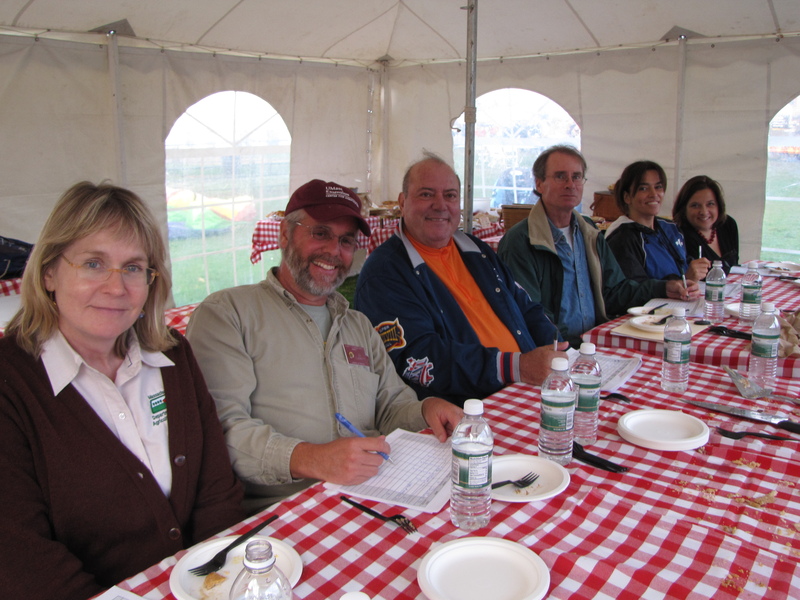 There were five other judges besides me: Rose Arruda and Bonita Oehlke from the Massachusetts Department of Agricultural Resources, Jon Clements, a tree fruit specialist from University of Massachusetts Extension, food editor Amy Traverso of Yankee Magazine, and a local business owner named Bernie (whose last name escapes me). It rained for the first 20 minutes or so of the judging, and the day was breezy and cool, in the mid-50s. A crowd gathered anyway, many of them the (mostly) women and men who had entered pies, and their families. Some stood beneath an adjacent tent that housed the afternoon’s main entertainment, a polka band that played loudly and exuberantly in the background the whole time we sampled pies. Event organizer Audra Lissell and emcee Greg Byrne of local radio station WSRS-FM introduced and served the pies, walking each one in front of the judges so we could take in its appearance. Some of the pies were true works of art, decorated with sculpted pastry apples, maple leaves, and flowers, arranged in baskets or amid a tableau of evergreens and dark red apples taken from a tree in the cook’s back yard, or with beautifully fluted edges sealing perfect-looking crusts. 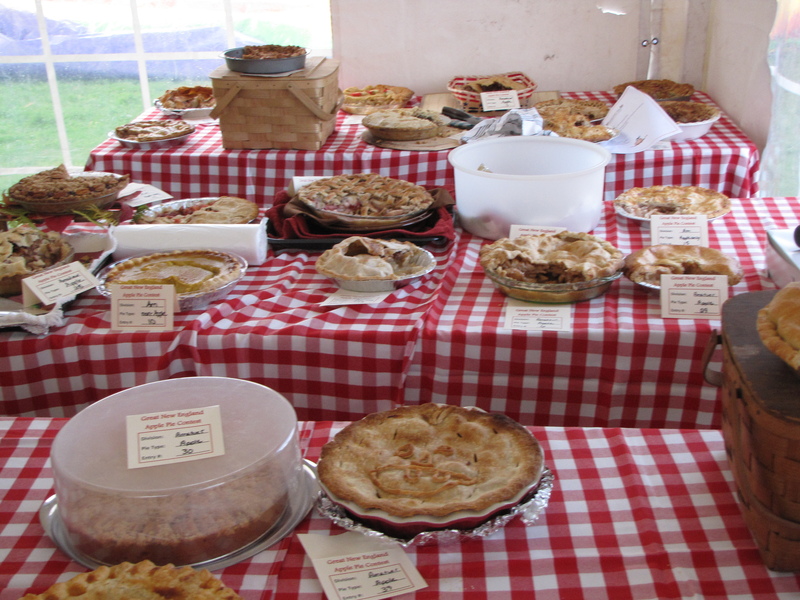 There were two main categories: “apple only,” and “apple and other,” for pies that added to the apples ingredients like cranberries, raisins, raspberries, pears, and pecans (one pie even had meat in it). There were crumb tops and traditional pie pastries, and some that were almost the consistency of shortbread. Some pies had stunning woven or lattice-work tops. There were crusts decorated with faces and apple-skin coils and symmetrical vents. Some were dark or light, shiny with egg wash or sprinkled with sugar. 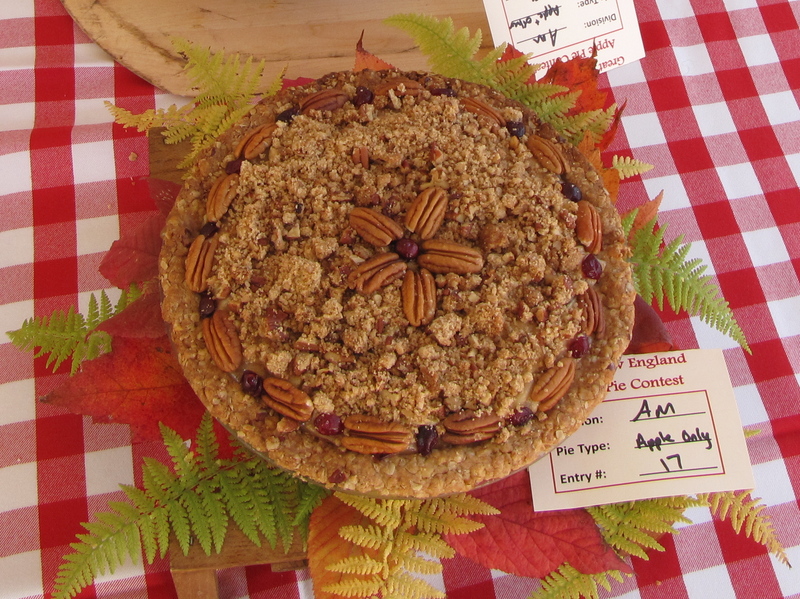 There was even an entrant that had a layer of apples between a cake-like base and crumb top served side-less, like a tart. 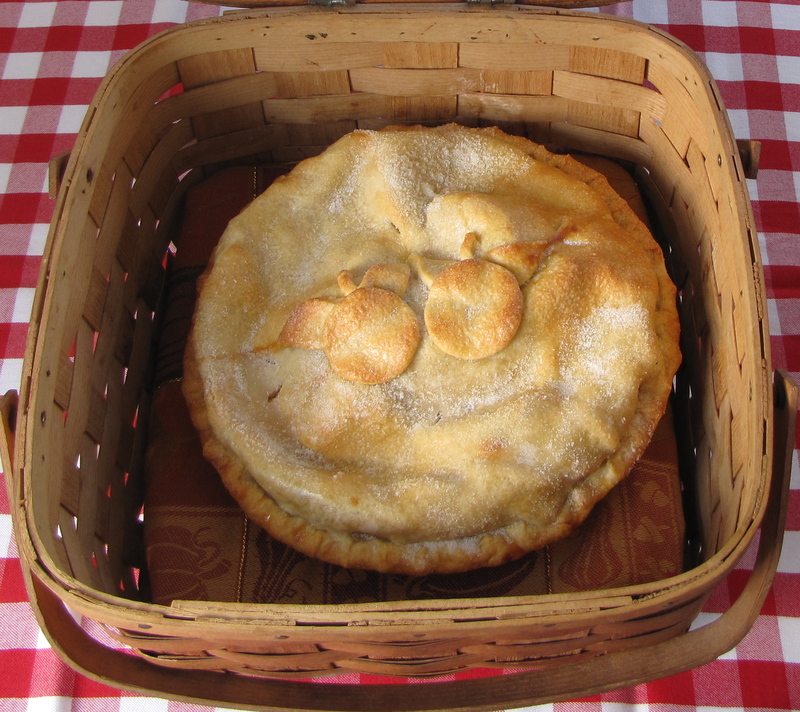 Many were simply classic, unadorned traditional-looking apple pies. We did not know the varieties of apples we were eating. Some pies were piled high (Cortland? Mutsu? Northern Spy? ), while in others the filling had settled beneath a cavernous top crust (Macoun, McIntosh?). Some were sweeter, some more tart, but these were the only clues to the apples’ identity. Some pies clearly used a single variety, others a mix. The textures were widely variable, partly a result of the varieties used, but also a determination by the bakers to have their apples firm, tender, or soft. Spicing, too, was as varied as you might expect coming from 35 cooks. This proved to be the most challenging aspect of pie-making. SPICING AN APPLE PIE is a delicate business. You need to have just the right blend to accent the apple flavor, rather than overpower it. Most of the traditional choices to spice an apple pie — cinnamon, clove, nutmeg, allspice — have intense flavors that can easily overwhelm. They must be applied lightly, and mixing them properly takes a special skill. The spice that left the strongest taste from Saturday’s contest was nutmeg, which lingered in my mouth for an hour or more after the event. Despite the challenge of making a consistently flaky crust, there were some excellent entries, and only a few that were either too hard, thick, or gummy. Several tasted as if they contained some whole wheat flour, giving them a boldness and complexity to match the apple filling. 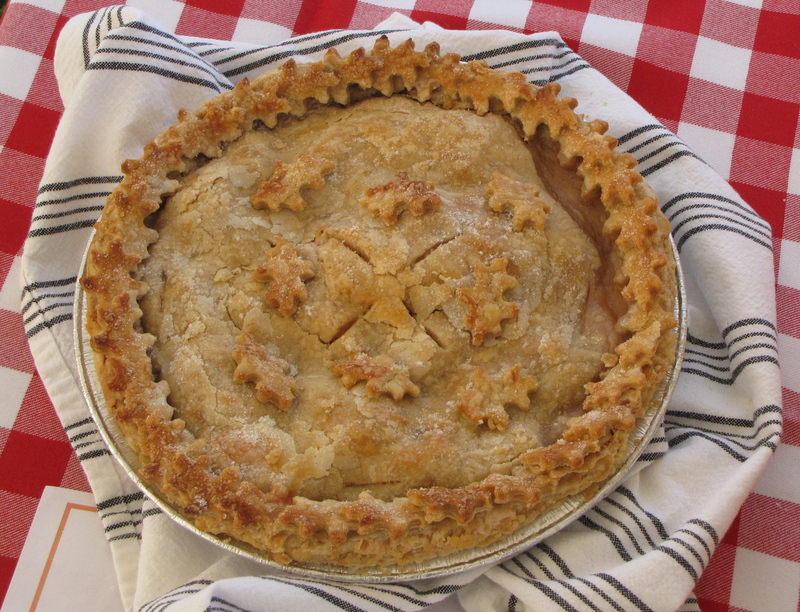 I LIKE A PIE that risks almost everything on the strength of its apple flavor, contained by a flaky, buttery crust that cuts easily with a fork and contrasts in texture and sweetness. A good crumb topping lends a pleasing finish to tasting, especially if it is garnished with nuts, chopped fine or whole. First and foremost, I want to taste apple, so too much sugar and spice can eliminate a pie from exalted status (despite the apple’s natural sugars, most cooks err on the side of sweetness). 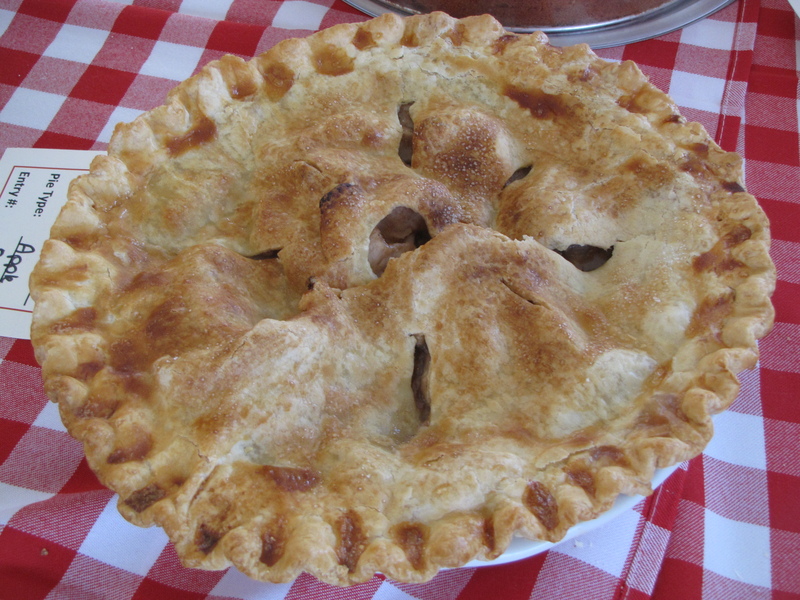 Other fruits, though, can add interest to the pie, giving it a more complex flavor, texture, and color. Tasting an apple pie meeting these various criteria — and there were several yesterday — is sublime. Last year I ate too much from the early entries, and by around the tenth pie I was so full that each new one became a sensory blur. But this year, despite the fact that there were twice as many pies to taste as a year ago, my two-bite system worked, and I was able to give each entry the attention it deserved. It was truly impressive. There was not a bad pie in the bunch, and there were some exceptional ones that made me wish I could take them home with me. It was moving to look out at the expectant faces as the pie chefs and their loved ones nervously watched us sample their wares, and an awesome responsibility. Pie preference is subjective, and despite the consistent rating categories, our scores varied widely. Still, there were clear winners in both categories and some close runners-up when we tabulated the judging. We’ll be featuring the winning recipes later this week. Thanks, Jon. I hope we are asked back next year! Great Article and Great Pics!! Ohh and Great Looking Judges!! I don’t envy your job, but I’d love to participate sometime. …and I had to read this right before dinner! Mouthwateringly descriptive, Russell.